This photograph has been taken from in front of the Hotel Milord, looking across the Rue Emile Desourteaux towards the Catholic Church and is said to date from late 1944 (the month of November is a bit of a guess). As can be seen, the church is in ruins, as is the building in the foreground. Note the fallen roof of the building that the family is sitting in front of. The relatively intact state of preservation of the tiles, points to a destruction by fire and not explosives, as has been claimed by various people. Note that the plaque behind the crucifix that is there today is not present at this time. 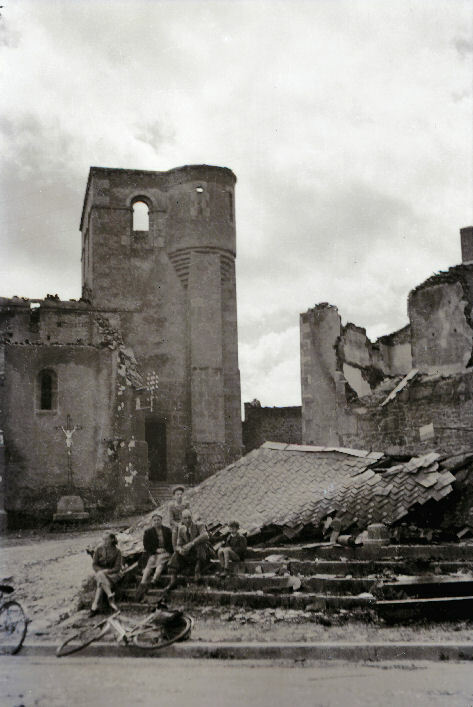 The poor quality of photographs of Oradour taken in 1944, is easily explained by wartime shortages of suitable equipment and chemicals for development and processing. Compare this view with that of June 1998.